Trying to protect his pregnant wife, scientist Ashwin Rathore gets killed – unexpectedly and unwantedly. A deadly force lurks in the murk that wants her too, but why? Is it because she works for and with the military and Intelligence teams in the country, or is it because she knows something that no one else does? With the current norm of throwing spotlight on the women, the authors, too, are centring their plots on dauntless and rebellious female protagonists. 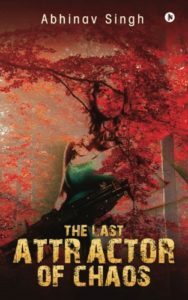 ‘The Last Attractor of Chaos’ is a fast-paced twisty thriller that can leave your forehead punctuated with sweat. Predictable yet mind-boggling at the same time, this novella narrates the story of Shruti, who is audacious enough to look at a challenge dead in the eye and give a wink! After her husband passes away, she transforms herself into someone who would not give up on life so easily. It is this spirit in her soul that irks many. Written with the creamy flow and concrete characterization, the story doesn’t fail to impress the readers. The abstruse cover, in a way, is very appealing because it gives the readers a chance to interpret the theme differently. However, the grammatical errors and the baffling blurb put the story on the line. Even the blurb is grammatically incorrect! There are certain chapters that have a gratuitous narrative. The story has been well amalgamated with theories of science, particularly quantum physics, which makes the plot even more intriguing. The concept of afterlife and particle theory gel well with the characters too. It is commendable how beautifully the author has used the prior knowledge to bring out the best in the plot. Overall, the readers might find the ‘scientific’ quotient thrilling as well as entertaining. Give this book a chance to enthrall you!